In this Japanese name, the family name is Hanabusa. Hanabusa Itchō (英 一蝶, 1652 – February 7, 1724) was a Japanese painter, calligrapher, and haiku poet. He originally trained in the Kanō style, under Kanō Yasunobu, but ultimately rejected that style and became a literati (bunjin). He was also known as Hishikawa Waō and by a number of other art-names. Born in Kyoto and the son of a physician, he was originally named Taga Shinkō. He studied Kanō painting, but soon abandoned the school and his master to form his own style, which would come to be known as the Hanabusa school. He was exiled in 1698, for parodying one of the shōgun's concubines in painting, to the island of Miyake-jima; he would not return until 1710. That year, in Edo, the artist would formally take the name Hanabusa Itchō. Most of his paintings depicted typical urban life in Edo, and were approached from the perspective of a literati painter. 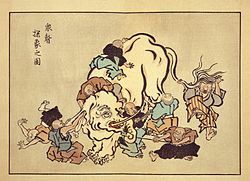 His style, in-between the Kanō and ukiyo-e, is said to have been "more poetic and less formalistic than the Kanō school, and typical of the "bourgeois" spirit of the Genroku period". Hanabusa was the master of the later painter Sawaki Suushi. Hanabusa studied poetry under the master Matsuo Bashō, and is said to have been an excellent calligrapher as well. Wikimedia Commons has media related to Hanabusa Itcho. This page was last edited on 6 November 2018, at 02:53 (UTC).